Why is economic growth and prosperity in the world so patchy and unstable? Why have incomes for so many people stagnated? Why is there so much inequality – and why is there so much debt? Are all these conditions inevitable or are there more effective ways of ordering our economic affairs to achieve better results? In this new book, the economist and entrepreneur John Mills confronts these questions and shows how the problems we face are not insoluble – if we are prepared to learn the lessons from the past. Drawing extensively on economic history, he demonstrates how the current policy framework is flawed and how a radical new approach is needed to close the divide between those who have done well out of globalisation and those who haven’t. 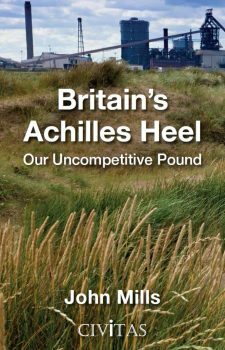 At the root of our difficulties lies an economy that has been allowed to become uncompetitive because of the long-term strength of the pound and unbalanced because of the deindustrialisation that has ensued. Reversing this process calls for a commitment to re-expanding the UK’s manufacturing base that must start with an activist exchange rate policy designed to keep the price of sterling down. John Mills is an entrepreneur and economist who has long been involved with political affairs. He is the founder and chairman of John Mills Limited (JML), which specialises in selling high volume consumer products, using audio-visual methods for promoting their sale both in the UK and in many other countries – about 85 at the last count. His main interests as an economist are the UK’s relationship with the EU and the relatively poor performance of western economies compared with those in the East. He was for many years a senior Labour elected member of Camden Council, the London Boroughs Association and the Association of Metropolitan Authorities, and in the late 1980s he was Deputy Chairman of the London Dockland Development Corporation. He was chairman and then deputy chairman of Vote Leave, joint chairman of Business for Britain and the founder of Labour Leave, all campaigning for Brexit during the run-up to the June 2016 EU referendum. He is on the board of OpenDemocracy, vice-chairman of the Economic Research Council and chair of both The Pound Campaign and Labour Future, all concerned in different ways with the UK’s economic and political prospects. He is a frequent commentator on TV and radio and he has a large number of published books, articles, pamphlets and tracts to his credit. He is the author or joint-author of 10 books: Growth and Welfare: A New Policy for Britain (1972); Monetarism or Prosperity (with Bryan Gould and Shaun Stewart, 1982); Tackling Britain’s False Economy (1997); Europe’s Economic Dilemma (1998); America’s Soluble Problems (1999); Managing the World Economy (2000); A Critical History of Economics (2002); Exchange Rate Alignments (2012); Call to Action (with Bryan Gould, 2015) and The Real Sterling Crisis (with Roger Bootle, 2016).